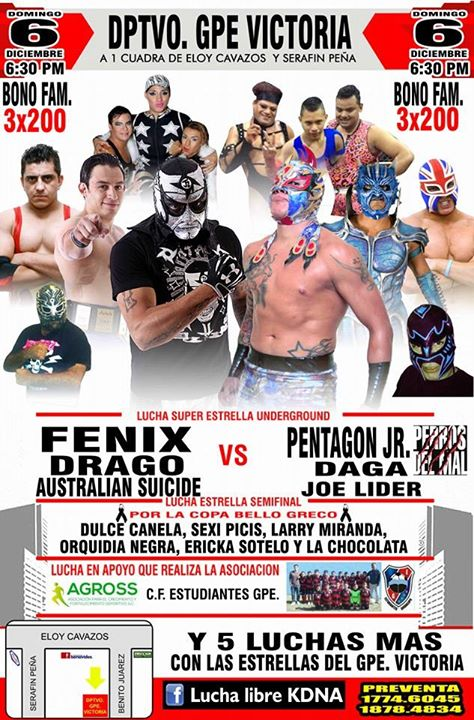 6) Australian Suicide, Drago, Fénix vs Daga, Joe Lider, Pentagón Jr.
5) Fénix & Psycho Clown vs Pentagón Jr. & Texano Jr.
2) Jinzo vs Black Extreme, Kaientai, Explosivo, Sniper, The Tiger, Lemus Jr.
4) Hijo del Dr. Wagner Jr., Laredo Kid, Perseus vs Herodes Jr., Hijo de LA Park, Mocho Cota Jr.
3) Angelo, Asterisco Jr., Batman vs Gigga, Luminoso Jr., Único Jr.
4) Monsther Clown, Murder Clown, Psycho Clown vs Daga, Parka Negra, Pentagón Jr.
Mini Psycho moved to the tecnico side and Mini Abismo replaced Octagoncitocito. 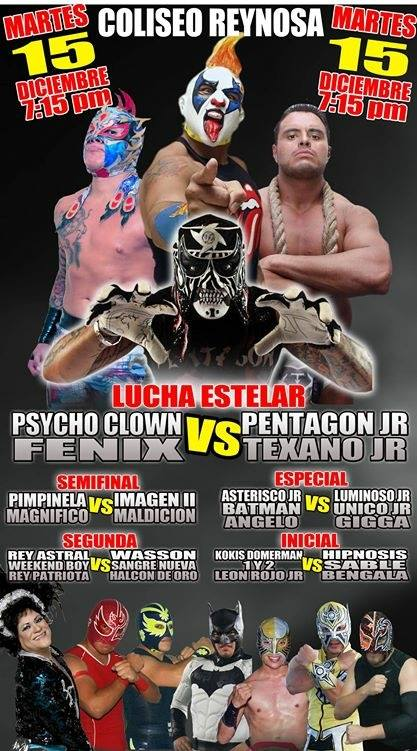 Bengala replaced Angelico, said to be injured. 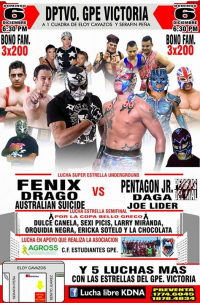 Event Notes: It rained, but turned out is said to be OK.
6) Argenis & Drago b Daga & Pentagón Jr.
Fenix showed up on crutches and said he couldn't wrestle tonight even though he really wanted. 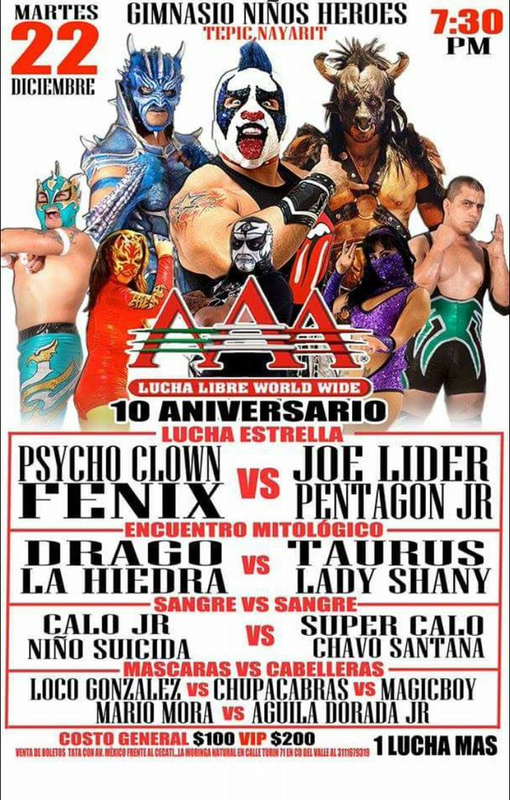 Pentagon attacked Fenix. 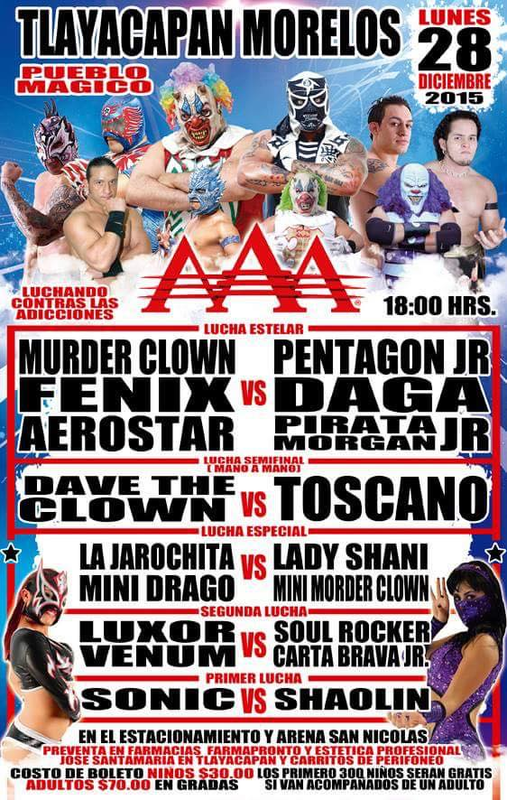 Arez made the save, though Argenis actually took Fenix's spot in the match. 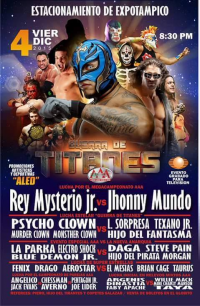 Hijo del Tirantes helped the rudos, but a tecnico referee (Jhony Rojas) gave that side the win. 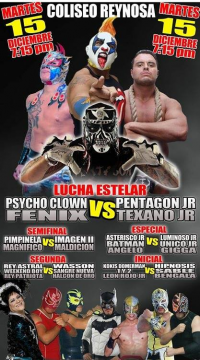 The Perros destroyed the tecnicos after the match, taking Argenis' mask, destroying Arez with chairs and tried to injury Fenix more. 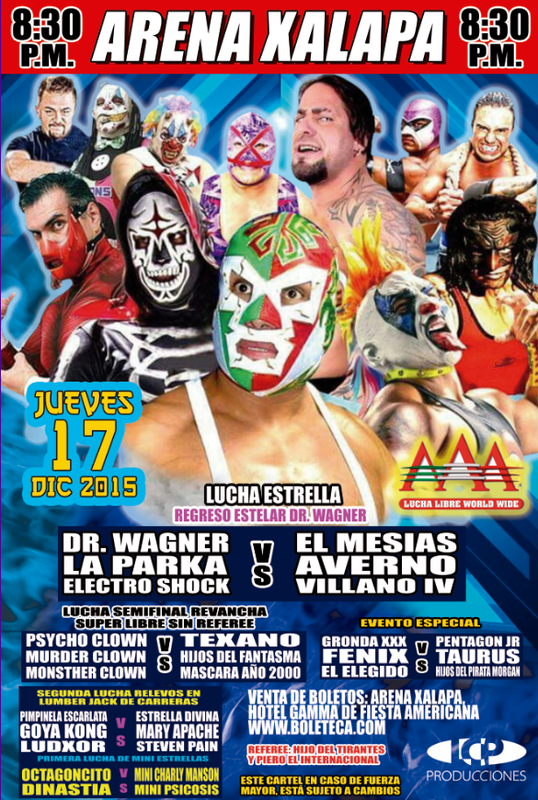 Tirantes attacked the tecnico referee too. 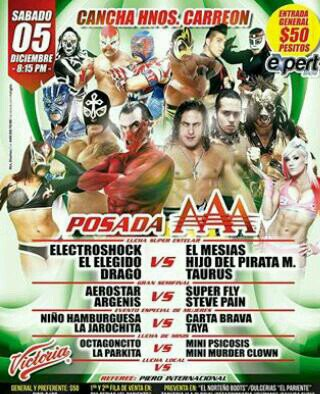 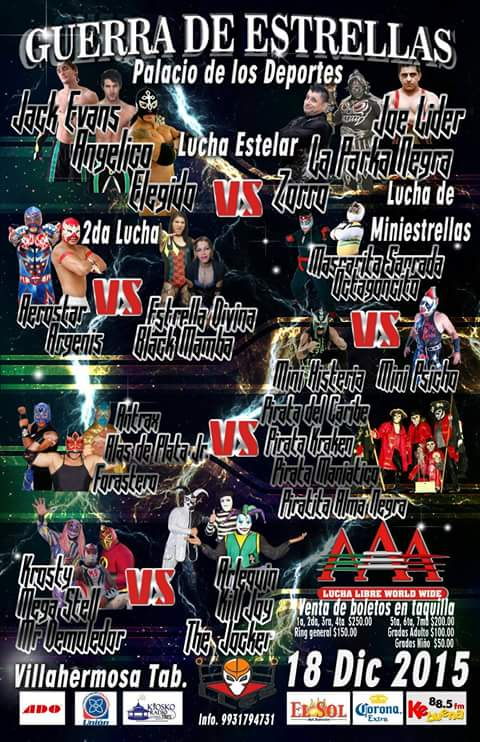 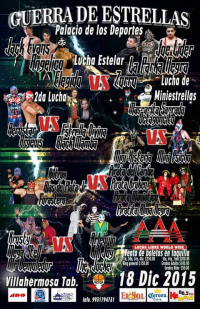 Flamita replaced Angelico. 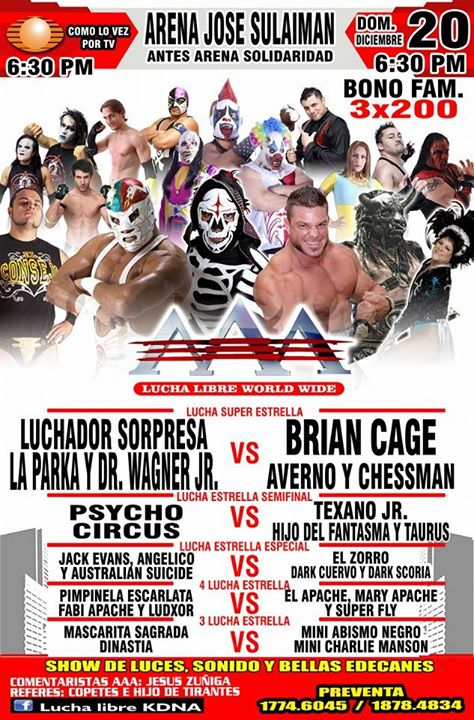 Zorro hit Jack with a cane to set up Escoria's win. 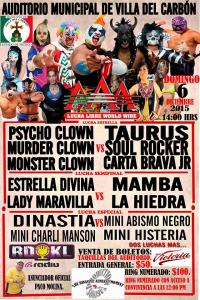 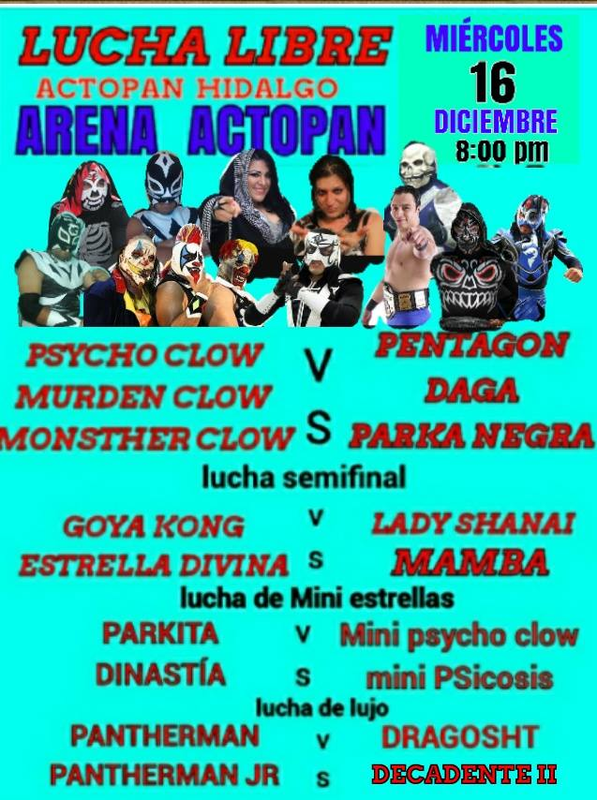 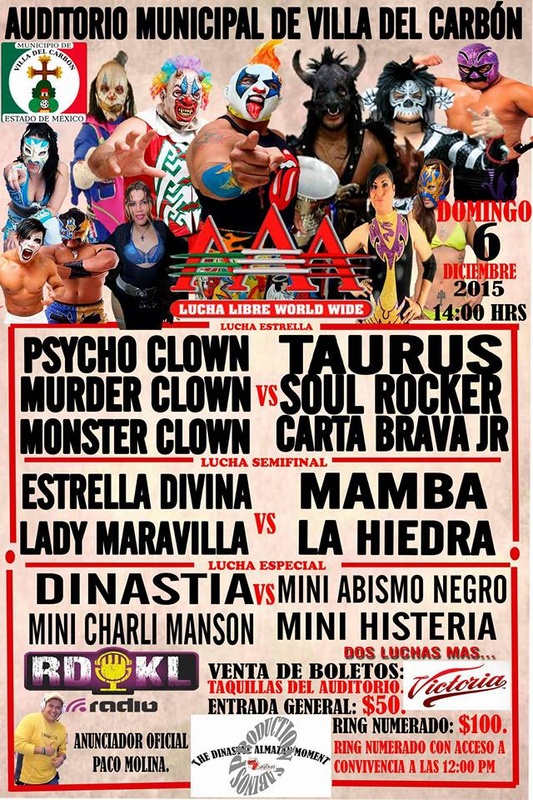 7) Electroshock, Monsther Clown, Murder Clown b Parka Negra, Taurus, Texano Jr.
Psycho Clown was the surprise wrestler. 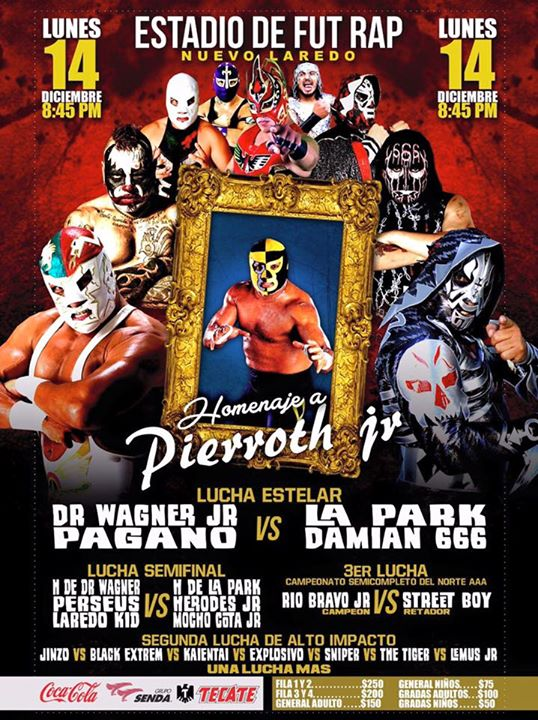 He was already scheduled on the show in the semimain (so something might have fallen thru?) 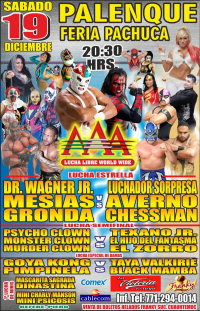 Wagner beat Averno. 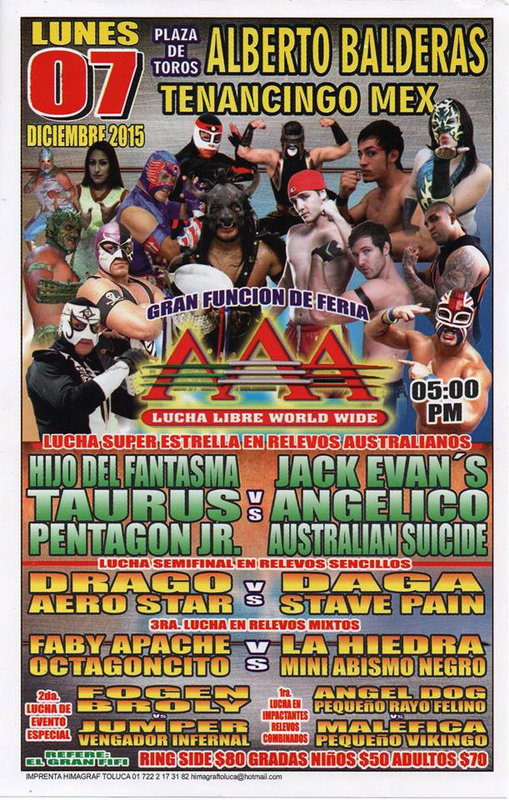 Show ended up at midnight. 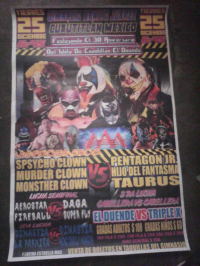 Event Notes: The ring had problems since the first match - a pole got detached from the base on the floor. 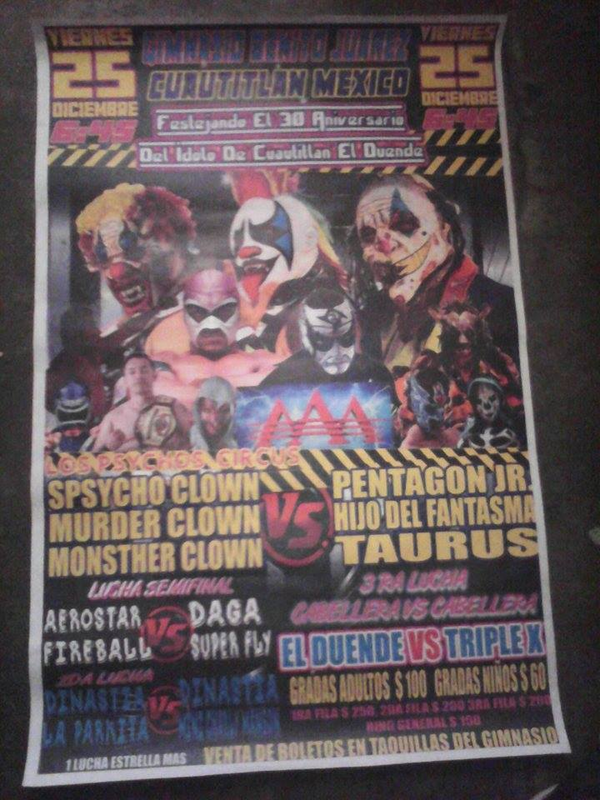 They continued on anyway. 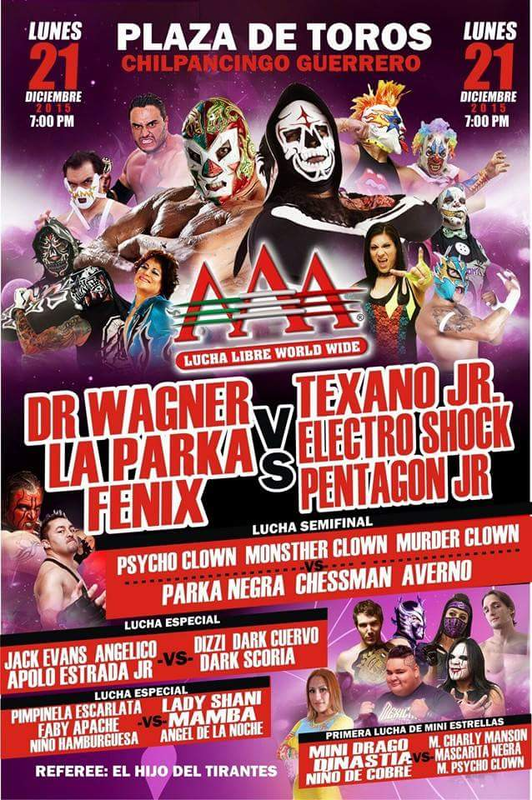 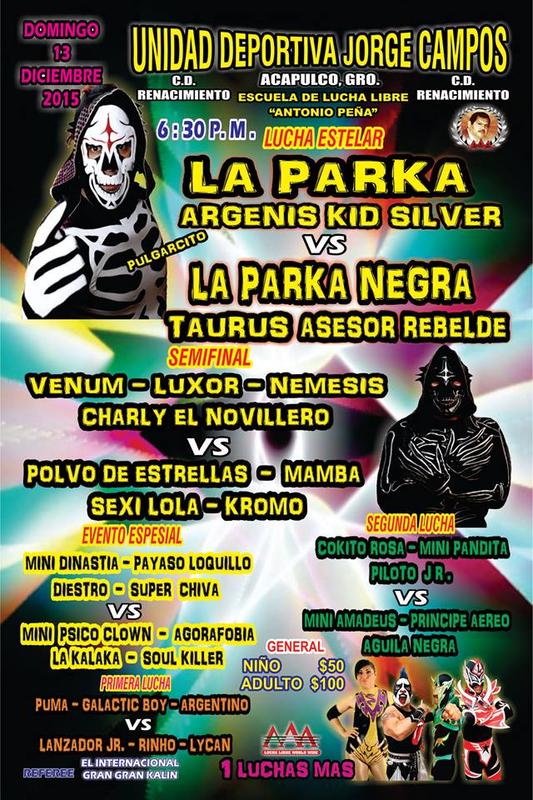 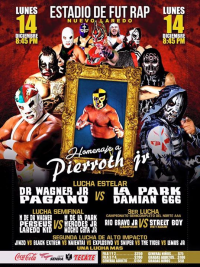 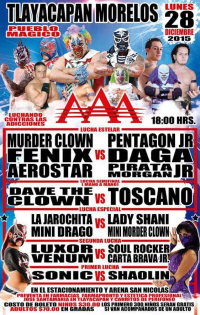 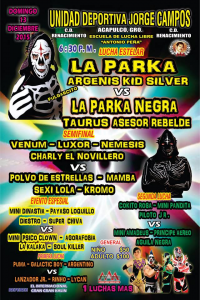 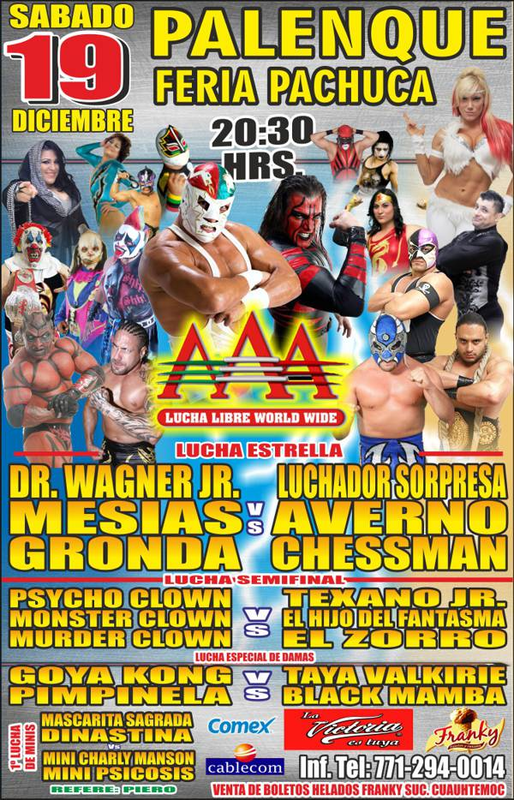 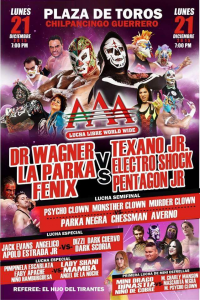 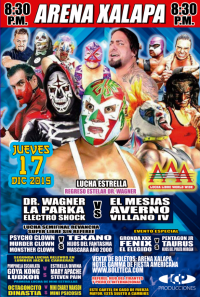 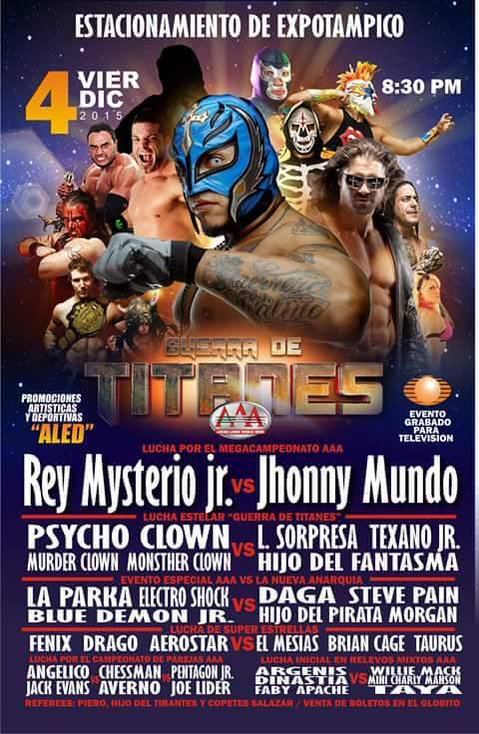 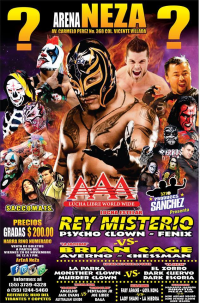 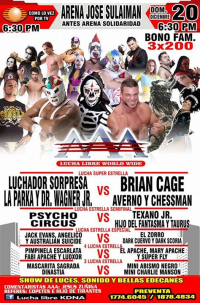 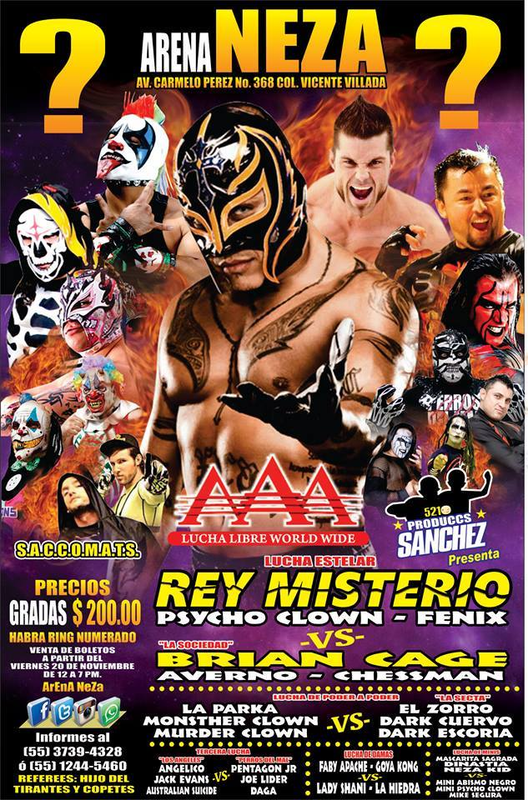 5) Dr. Wagner Jr., El Fénix, La Parka vs Electroshock, Pentagón Jr., Texano Jr.
5) Fénix & Psycho Clown vs Joe Lider & Pentagón Jr.
5) Aerostar, Fénix, Murder Clown vs Daga, Pentagón Jr., Pirata Morgan Jr.